Rancilio Silvia and Breville BES920XL Dual Boiler are great espresso machines you can get in the market. These machines not only offer you great brew but also tons of supportive features. If you plan on purchasing a new espresso machine, you may want to read our article below to help you decide your choice. Rancilio Silvia is an espresso machine from the same name company. This espresso machine promise you a professional brew at your own home without having to go out to coffee shop or similar establishment to enjoy your favorite beverages. With the machine you can enjoy high quality brew any moment, not only you can make espresso, you also can make coffee and steam milk base drink since the machine also have built in milk frother. From the outside the design of Rancilio Silvia is very practical with industrial look. The body is built with sturdy stainless steel casing while the inside components are made from brass. This espresso machine is currently one of the most popular espresso machine available in the market today. 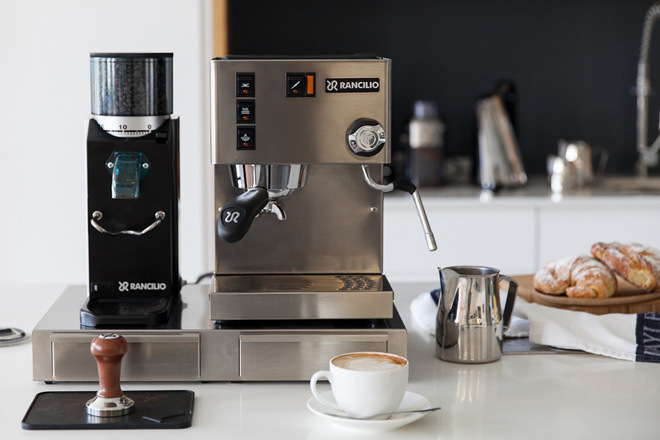 Coming from Rancilio, you can expect a simple yet reliable as well as powerful operation. All of the controls is placed at the front of the unit for convenient operation. Since it doesn’t have a grinder, you may want to purchase a good grinder like Baratza Encore or Virtuoso. As it have been mentioned earlier, Rancilio Silvia comes with a built in milk frother, so you can change your bitter espresso to milder beverages like latte or cappuccino when not in the mood for dark espresso. This steam wand is made from commercial grade chrome plat to deliver you plenty of steam as well as piping hot water for your Americano, Tea, or other beverages. With its three thermostats, this machine will manage the temperature for espresso, steam and boiler heat to ensure you will get excellent espresso from every brew. The water boiler is made from brass with maximum capacity of 12 oz. to heat your water quickly as well as maintaining the temperature through repetitive uses, so you will not have to wait long for your espresso to get done. To reduce splatter and makes the machine easy to clean, it have commercial grade pressure relief system that utilizes a 3 way solenoid valve. In attempt to make the machine able to extract your ground better, chrome plated brass group is uses to ensure even heat distribution. Rancilio Silvia water reservoir maximum capacity is 67 oz. which can be removed easily for regular care. You may fill the tank while the machine is operating or by taking the tank out. To give you rich espresso, 15 BAR heavy duty pump is planted in the machine to effectively force water through your chosen grounds and extract it full flavor. The PID controller also makes the machine stay at its best temperature to give you best shots. This espresso machine comes with heavy duty chrome plated brass and two stainless steel filter baskets; one for single shots and the other for double shots, all measure 58 mm in diameter.To warm your cup and make the crema in your espresso stay longer, Rancilio Silvia also have warming surface on the top of the unit. Breville BES920XL Dual Boiler is an espresso machine from the same name company. This espresso machine is the upgraded version of its older brother the BES900XL, with improvements mainly on the machine ability to drain the boiler on their own. The current version also claimed to be more user friendly, since you can descaled it at home by unscrewing the two screws on the front of the machine without having to visit their service center. Coming from Breville, you can expect the machine to last for years while providing you rich espresso anytime you want. From the outside this machine is pretty stylish with stainless steel body, which is pretty compact measuring at 16.25 inches in width and 15 inches in depth, so even though it looks pretty big on the picture, it’s actually pretty compact in reality. It is perfect for those aspiring at home barista or offices. The boasted features in Breville BES920XL Dual Boiler is the dual boiler itself. In most cases these boilers is only available in machines that comes 3 times pricier, but instead of stainless their double boiler is commonly made from copper. 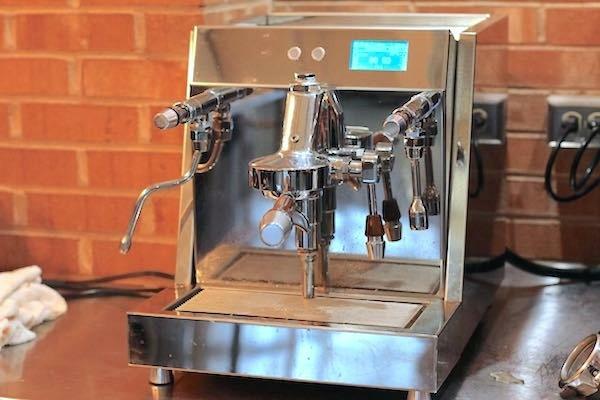 The company also put a lot of programmability into this machine, so now you can adjust the steam boiler temperature at a range of 265°F – 285°F, adjust shot length, extraction time, and you even can customize the amount of time and pressure for your pre-infusion. Pre infusion is an important step to extract the taste of your ground, since it will allow the ground surfaces to be saturated. Pre-infusion customization is the most sophisticated feature in Breville BES920XL Dual Boiler, since you can’t find it in many other machines. For those who still not satisfied with the customization, you can even control the machine’s audio, maintenance alerts as well as water hardness. As it have been mentioned earlier, the machine have dual boilers, so you can expect to brew your coffee while frothing the milk at the same time. When talking about espresso machine, we can’t forget about the PID control. The PID control in Breville BES920XL Dual Boiler will control the interior temperature of its boilers with LED screen, so you can see the temperature clearly. PID is used to maintain or regulate the temperature to help you get the best temperature for perfect coffee. Now, let’s compare Rancilio Silvia with Breville BES920XL. 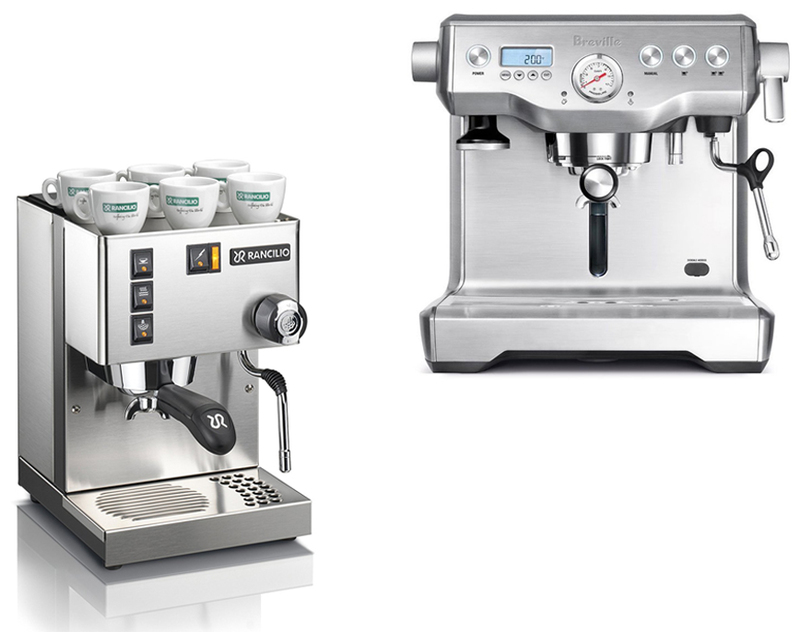 The most prominent difference between both is that Breville is programmability, while Rancilio Silvia is not. The water tank also larger in Breville since the machine is also bigger. Another difference between the machines is you can froth the milk together as the machine brew the coffee, since it have dual boiler. At the other hand you can’t perform those two tasks at the same time in Rancilio Silvia. Coming with more feature also makes Breville BES920XL Dual Boiler offered at higher price. In our opinion, if you don’t mind about spending more, we do thing Breville is a great option.